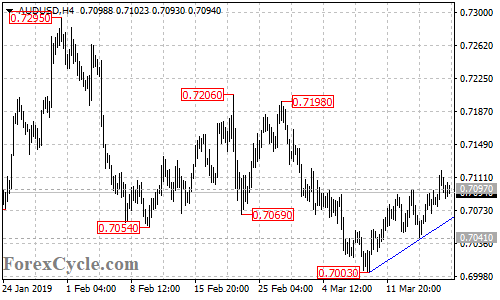 AUDUSD broke above 0.7097 resistance and extended its upside movement from 0.7003 to as high as 0.7119. As long as the price is above the bullish trend line on the 4-hour chart, the upside movement could be expected to continue and next target would be at 0.7170 area. Only a breakdown below the trend line support could signal completion of the uptrend.